A 1942 image of Cape Cod taken with an experimental airborne search and bombing radar developed at MIT’s Rad Lab. This image revealed, for the first time ever, the exact shape of Cape Cod. Courtesy: Research Laboratory of Electronics at MIT. World War II was a watershed in the history of many different technologies, not the least of which was radar. In the United States much of radar research took place at the Massachusetts Institute of Technology’s Radiation Laboratory or Rad Lab. Engineers and scientists at Rad Lab designed almost half of the radar deployed in World War II and also launched a new era of collaboration between government, industry, and academia. The results were stunning. The MIT Radiation Laboratory, which operated between 1940 and 1945. There, researchers developed fundamental contributions to the design and deployment of microwave radar systems. 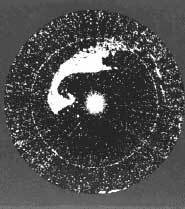 Radar was a decisive factor in the outcome of World War II. Courtesy: Research Laboratory of Electronics at MIT. In the late summer of 1940 Britain faced Germany almost alone. France had been defeated, and the Soviet Union and Germany were observing their non-aggression pact (Hitler would turn on Stalin in June 1941). Dependent as it was on shipborne commerce, Britain was gravely threatened by Germany’s submarines. The United States, though officially neutral, was becoming involved in helping Britain maintain its shipping lifelines. It was at this time that the British Prime Minister Winston Churchill decided to send a technical mission to the United States. Known as the Tizard mission, after its leader Sir Henry Tizard, it shared information about technologies critical to the outcome of the war: jet aircraft, submarine detection devices, gun directors, and radar. It was becoming clear to British leaders that radar could play many important roles during the war and they hoped to enlist the resources of the United States, which had the world’s largest radio manufacturing business, in developing radar. The Tizard mission convinced U.S leaders that radar was becoming a supremely important weapon of war. It also shared with the U.S the invention of the cavity magnetron, a device used to generate microwaves for radar systems. The establishment of the Rad Lab, was, perhaps, the most important consequence of the Tizard mission. 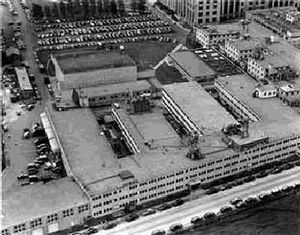 Called the MIT Radiation Laboratory (an intentionally misleading name), it became one of the largest wartime projects ever, employing nearly 4000 people at its peak. Engineers and scientists from around the country were recruited, and during the war more than 100 different radar systems were developed there. The work at the Rad Lab opened up an extensive new realm of engineering—microwave engineering. And, although Rad Lab formally closed on 31 December 1945, its impact continued to be felt. After the war, Rad Lab work was shared with the world in a monumental publishing effort, the MIT Radiation Laboratory Series of books. The 28 volumes of this series encapsulated a huge amount of knowledge generated during the war and strongly influenced many areas of postwar engineering. Another legacy of Rad Lab was the establishment of strong institutional links between government, industry, and academia. This set an example of collaboration among these groups, and after the war large-scale government support of scientific research became much more important than before.